Location, Location, Location. Historic Downtown And The Arkansas River. 30 days or more ONLY! (no lodging tax). Built in the 1880s, this brick Victorian will be sure to amaze you in both amenities and location. Come stay in historic downtown, surrounded by parks, walking trails and weekly entertainment. Located across the street from the historic Robison Mansion and only half a block from the Arkansas River and river walk. The perfect place for the rest of the wedding party to stay if you're attending a Robison Mansion wedding or event. Gold medal fishing, Gold panning, rafting, tubing and hiking is only half a block away. This is the perfect location to stay for your rehearsal dinner the night before the wedding with both a formal dining room and an eat in kitchen. Outdoor patio seating for 7 to enjoy our beautiful weather, and an indoor sun room and screened front porch for the occasional foul weather day. We welcome travelling professionals (extended stays)! Government Employees/Healthcare providers/Others can stay at seasonally adjusted PerDiem Rates and adjusted billing structure for reimbursement purposes. Please text or call to set this up. We are rehabbing this brick beauty into a vacation rental for years to come. Watch us grow as we complete the upstairs area in the future to add more bedrooms and bathrooms. Huge fenced yard for the children and pets to roam and a beautiful indoor oasis. I can't stress enough the location and the upscale feeling of this beautiful home. We found this property in April of 2015, I am a Realtor in the area and had shown it to a client. They had decided to pass because it was not move in ready. I saw right off the potential and the home was just begging to be brought back to its glory. Our first summer of rehabilitation is complete, come and visit the French country / Victorian pleasures of this home. The second floor rehabilitation is scheduled for this winter. Little by little we will make improvements to the home to make it rival any home. It is our true desire to completely rehab the home to a country style charmer. LOCATION says it all.. The Arkansas River and riverwalk is only half a block away. All summer long Veterans Park (just across the river) plays host to many events from the farmers market to music on the lawn. This home is currently one level living with the bedrooms on either side of the house. The bathroom is adjoining the master bedroom and the kitchen is large but offers a formal dinning room. The home has a sunroom located off the dinning providing outdoor living during inclement weather. We understand what is like to "live" on the road as part of your profession. Government and Healthcare workers on PerDiem / temporary duty assignments please contact us via text/email with your dates and we will work out the best rates for you and provide the billing formats you need for reimbursements. Large Eat in Kitchen, formal dining room and all the utensils you'll need . Kitchen 4 chairs, Formal 6 Chairs, and Outdoor 5 Chairs. Large backyard, Even larger side yard for events. Back yard has a small pond and is fenced. Please give us advance notice to make this option available. 30 Days or more- Downtown Canon City Historic area, 1/2 block to Arkansas River and riverwalk, across from the historic Robison Mansion, 3 blocks to Royal Gorge Railroad station, 7 miles to Royal Gorge Bridge and numerous attractions such as Rafting/Horseback Rides/Zip Lines/Helicopter tours. 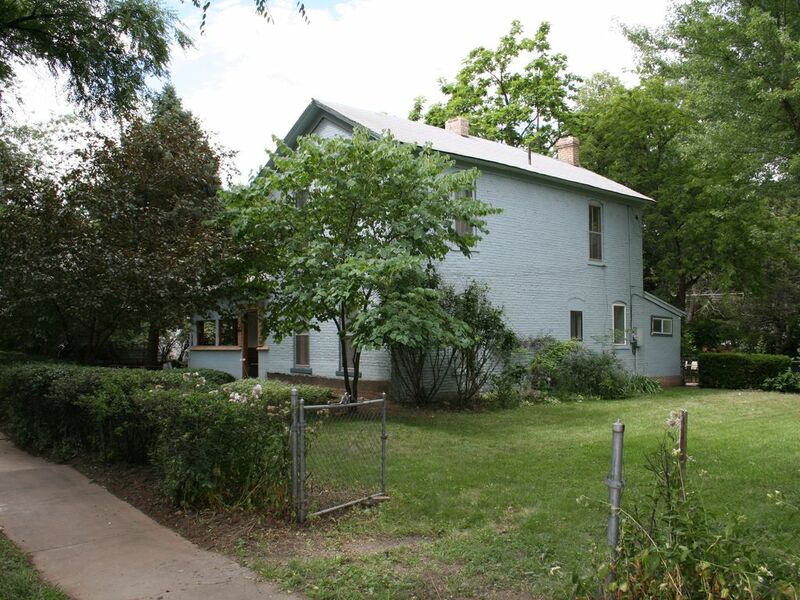 1/2 Block from Veteran's Park that hosts regular music events and Tuesday farmers market. If you're attending a wedding at the Robison Mansion (one of Colorado's top ten historic mansions), this is the place to stay as the mansion sits just across the street from the home. With a fenced back yard and large side yard for entertaining. My wife and I rented this property for a month and we had a great experience. House is cozy, rooms have a nice size and everything looks neat and nicely decorated. My two dogs loved the backyard and the trails by the Arkansas river, which is just a minute away from the house. The owner, Troy, is fantastic! He is approachable, very kind, flexible and understandable. He is always available when you need something but he is very respectful of your privacy. House is conveniently located; it is very close to restaurants and stores. Deer come visit the backyard every now and then and are not afraid of humans so you can approach them. Overall, we had a really good time and everything worked out just fine. We can only thank Troy for letting us stay in his property for the whole month and for being so kind to us! Great location, house is great and very well maintained. My dogs loved the huge fenced yard, along with fun watching the deer share the yard. Sun room really heats up during the sunny afternoons. Definitely recommend staying here. My husband and I arrived at the house for a one week stay only to find one partial roll of toilet paper, one trash can liner and no dishwasher soap. I had asked where more might be and was informed there was none and we would need to get our own. The location was great and the house was very charming. Plenty of space in the bedrooms, kitchen and dining room. The separate laundry room is nice so you do not have to listen to the washer and dryer but it was nose-itable (noticeable) it had been a previous home for cats. We haul ATVs and found the drive a little challenging but doable if you can back up a trailer. Overall we were pleased with our stay. The part of the house that we stayed in has been restored and and nicely furnished. My two grand children (ages 8 and 4) especially enjoyed the big yard. One of the highlights was their seeing two fawns hopping around the backyard and then jumping a small fence to join their mother in the neighbor's back yard after which my grand daughter said, "This is even better than room service" - thus one of the benefits of VRBO over hotels! There is a great park with tennis courts, volleyball court, and children's playground just a few blocks away. We went to a farmers' market in Canon City, to Royal Gorge, and took a family rafting trip down the Arkansas River. Our hosts, Troy and Allison, were quick to communicate with us and that helped to make our stay even better. We loved our stay and would recommend it to anyone visiting Canon City! It's close to everything and the owners are just wonderful to work with. The only downside is that the bathroom is small but everything else was great! Literally killed 8 mice in 4 days. One of the heaters didn't work. When it came time to leave, refund wasn't provided. All things being equal, it is a good location, but not worth the cost, and certainly not worth the hassle. To our lodger who stayed at our home for 6+ months and gave us a poor review. Our goal for our rentals is to provide a high-end, clean, comfortable and private home for your stay. We do not wish to mislead or wrongly advertise the homes that we provide. Broken windows, tables and equipment, missing linens, torn up sheets and duvet covers, model glue covered furniture and sink fixtures. Unauthorized large dog brought into property without prior consent which the pet caused damage to vintage wood doors, floors and sofa. We are surprised by your poor review since you begged us to allow you to stay when we wanted to part ways after trying to chance down rental payments. We could not rent the property for almost a month to repair and rebuild the property to the condition it was in prior to you taking possession. We have tried multiple attempts to contact you but you failed to respond. NO LODGING TAX, Since this property is a 30 day or more rental, lodging taxes are not required. Rates maybe subject to change until booking is complete.